There’s plenty to love in the Mortal Kombat series, which is on the cusp of its 24th anniversary. That’s a lot of years that we’ve spent punching, kicking, and generally brutalizing this cast of characters. And in Mortal Kombat X, they’ve never looked better. I love the art in this game. It’s gorgeous. It’s dark and decadent, thick with lighting effects and luxurious textures. Each element, big and small, has been executed with care and precision. My favorite stage is the woods. It looks like a shot out of a stylized Hong Kong martial arts film. The sky is hazy, ominous. Packs of wolves race over the distant snowbanks. And then, in the foreground, two combatants locked in battle, leaping into the air, swinging on the bare tree branches and ripping them down for melee attacks. The little details of the character animations and attacks are perfect, especially in the newly introduced ones. For instance, before gunslinger Erron Black starts a match, he gives a tiny shake of his hand, getting his trigger finger ready to fire. Cali girl Cassie Cage is one of my favorites, too cool for school with her sunglasses and popping gum; I cackle every time she does the splits into a dual gunshot. And D’Vorah…D’Vorah is so fantastically weird. She’s every insect-inspired sci-fi villain come to life. 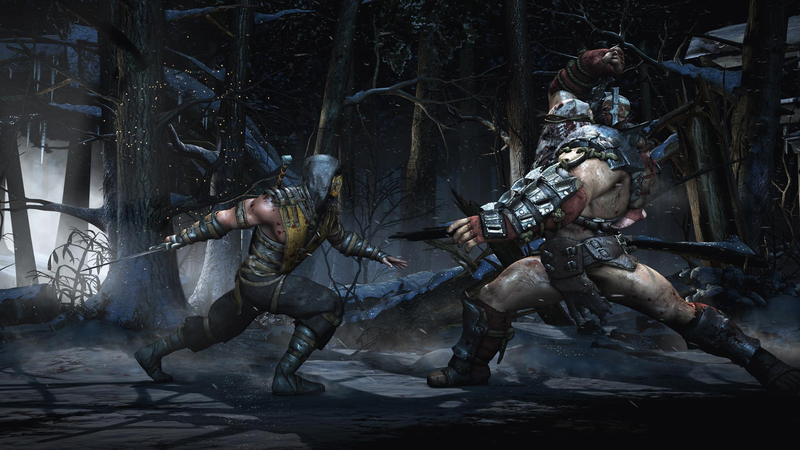 So yes, the participants in Mortal Kombat X and their world are all looking sharp. But the real star for the visual side of this game is, and always has been, the violence. The series’ brilliantly creative approach to dismantling and dismembering opponents has been well documented, adored and vilified in equal measure. In a game like this, violence is an artistic choice. The choices in not just what the attacks are, but what they look like, say a lot about the game’s attitude. Most gory games take one of two opposing angles to depicting violence. They might go cartoony, with bright colors and explosions that want you to not worry about the terrible things your character is doing. Or they take the hard edge, grim and gray presentations that want you to feel equally somber. Mortal Kombat X’s gothic beauty allows it to walk the line between the real and the ridiculous in a way that makes total sense to me. Leaning toward silliness wouldn’t fit the degree of feeling MKX has in its single player campaign. (No, really, it’s got a surprising amount of sincerity and nuance to it.) But it’s still a game where you can slice a person’s skull in half as the killing blow. Realism is not exactly what you’re looking for. And so the game wisely goes for a look that’s both stylish and stylized. What you see in the X-ray vision moments, with all those cracking bones, isn’t entirely untrue to real human bodies. Yet after having their skull and spine shattered, the victim will bounce right back up, costume still looking flawless, and give back as good as they got. The game takes itself and its appearance just the right amount of seriously. It has sheen and polish in the right places coupled with a blissful ignorance of silly rules like physics and anatomy. MKX all the more impressive because I’m a highly squeamish person. I’m really touchy about blood and guts, and I can’t handle most graphic depictions of them. But this is still one of the only fighter games I’ll pick up from time to time, even over a genre standard like Street Fighter or the more G-rated Smash Bros. When I’m playing MKX, I’ll emphatically punch in a fatality combo, then gag slightly even as I laugh out loud. There aren’t many games this disgusting that I simply can’t look away from. So happy early birthday, Mortal Kombat. May you have many more years of grossing me out with this much style.